Heat butter in a pan. once its hot,Add chopped garlic and saute until raw smell of garlic goes away. Add water ,maggi masala and mix well. Bring water to boil,and add maggi noodles and cook for 2 minutes. Once the water is evaporated,add chill flakes,oregano,cheese and coriander leaves and mix well. 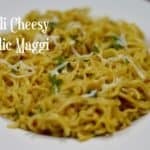 Chilli cheesy garlic maggi is ready and serve hot. Ymmy! Delicious! Simple! I always like butter maggi. It is very simple and so delicious. I used to make such butter maggi when I was in Hostel. I used to make such food at 2 o clock night too, haha.